Our trainers have 10+ years of experience in IT industry. They are knowledgeable and their skills to impart training is innovative which helps student to learn the concepts easily. We follow Practical approach for teaching with ONE PC PER Student to give better understanding of the subject to our students. We have flexible timing for our batches. We offers Personal Attention as we have max 10 students per batch. So, its easier for a teacher to cater the doubts of students and help them excel in their respective subjects. 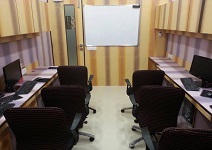 We have well equipped state of the art classroom with all the required facilities like projector, machines and comfortable chairs with all the required softwares for providing good student computing environment.